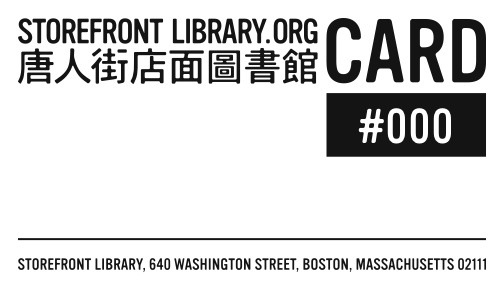 Volunteer Astrid Muller led a drive for Chinese-language materials from sources all over Boston, including local organizations and foreign student groups. We have quadrupled the Chinese materials on our shelves. Program Manager Amy Cheung and Library Interns created a circulation system so you will be able borrow books starting next week. 84 linear feet of shelving have been added to accommodate fiction and other genres appropriate for borrowing. We instituted a computer sign-up system, internet time limits, and new bi-lingual signage. Program Manager: Amy Cheung; Library Assistant: Shujuan Yu; Library Interns and Volunteers: Brianna Belanger, Laura Jean Miller, Adam Robinson, Jewel Chin, Susan Chin, Lucy Borgheiinck, Cindy Li, Heather MacLean, Astrid Muller, Patrick Murphy, June Ng, Jane Polson, Melissa Saggerer, Amy Sloper, Sharon Tomasulo, Maria Wong, Valerie Wong, Annie Wu, Emily Wu, Cynthia Yee. Visit the Storefront Library, tell them what you think, watch them make it happen.